Schnecksville, PA – Lehigh Valley Zoo has a few animals who are older and receive advanced care. The Dromedary Camels and the Palomino Horses are among our oldest animals. Just last year, Lexy, our Canada Lynx, passed away at nearly 19 years of age, the oldest living lynx on record with the American Association of Zoos and Aquariums (AZA) lynx population. To address the additional needs of its aging animals, the Lehigh Valley Zoo’s animal care team regularly examines the older animals and makes adjustments to their daily living to accommodate their needs as they age. Murphy, our Masai Giraffe, is one of the animals to which we pay particular attention. 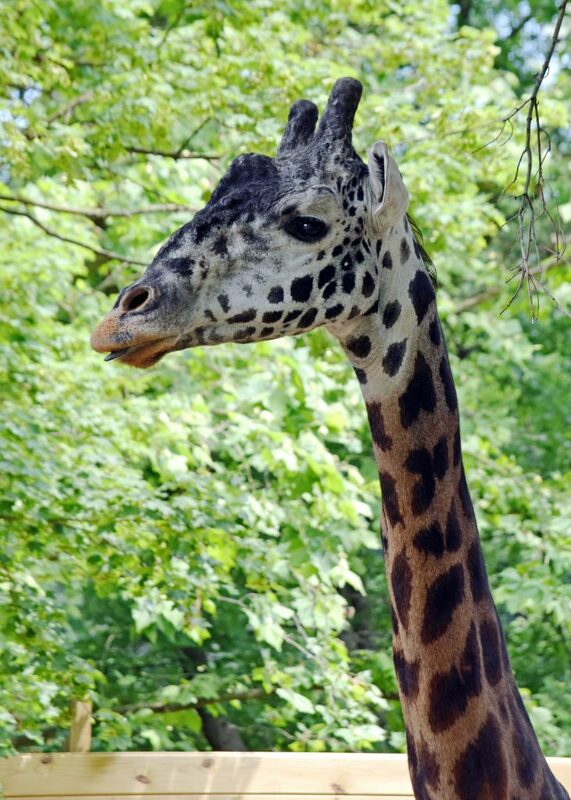 Murphy, at age 18, and despite his youthful and vibrant personality, is considered a more senior Giraffe amongst the Masai breed. This past weekend Murphy was a bit lethargic and this gave us some concern. Due to Murphy’s age, our zoo team is taking extra precautions. Murphy is being cared for around the clock by our highly trained animal care team and our very experienced veterinary staff to develop a comprehensive treatment plan. Also, our team is in touch with additional Masai Giraffe experts across the country so that no stone is unturned in our care for Murphy as he experiences this change in his health status. In an attempt to create an optimal temperature for Murphy we are temporarily halting visitors viewing our giraffe in the barn vestibule. Just as a human will seek a quiet, warm bedroom and no interruptions when sick, we want to give the same quiet, warm environment to Murphy. Opening and closing the barn door for visitors causes variations in temperature. If you would like to send Murphy a “get well soon” wish, please post your favorite picture of Murphy on our Facebook comments and enter your wishes in the comment section. We will keep everyone apprised of Murphy’s health.